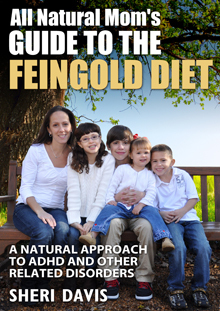 The Feingold Diet is mainly an ADHD diet, although it has been shown to help a variety of other symptoms. 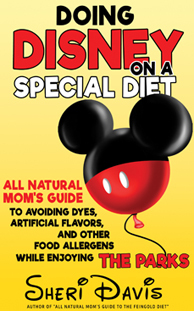 On this diet, we eliminate all artificial colors (like red #40, yellow #5, blue #1, etc. that you read on ingredient labels), artificial flavors (one common one is vanillin used in many chocolate foods), and certain preservatives such as BHT and TBHQ found in many breakfast cereals). Many people also choose to eliminate corn syrup, as it causes problems for many kids. After learning everything about artificial ingredients, it’s a way of eating I plan to continue for the rest of my life. I don’t believe it is safe for anyone to be eating these chemicals every day, as many Americans are (I’ll expand on that later). 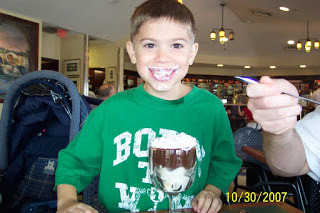 We started the Feingold Diet in February, 2005, when my oldest son, Cody, was four and a half. As soon as Cody started walking, he started running…and never stopped. He ran everywhere, was impulsive, had no fear, and was “all boy”. He was very athletic and so full of energy, and had a lot of tantrums as a toddler. It was incredibly hard to get him down for a nap or at night. He would stay up very late and I couldn’t figure out how to get him to settle down. He would literally be jumping up and down in his bed, laughing hysterically until he finally would just collapse and go right to sleep. (He had a habit of eating Mickey cereal before bed almost every night (lots of dyes), so it’s no wonder he had trouble getting to sleep). To describe him as “hyper” was an understatement. Everytime I went to the store someone would have to make a comment like “Wow, I wish I had that much energy”, or “You have your hands full”, or “He’s all boy.” I read in one book that kids with ADHD are often very cute with big doe innocent eyes that say “What me? What did I do?” That was Cody. It was hard to stay mad at him for long. He was so darn cute. I think God made these kids so cute because if he didn’t, millions of kids would be left on strangers’ doorsteps. 🙂 Just kidding. Cody was my first child, so I figured that was just how boys were, so I was determined that my next child was going to be a girl. I painted our spare bedroom pink in wishful thinking and I read a book called “Taking Charge of Your Fertility.” A great book that tells you, among many other things, how to ensure the gender of your child. It worked. I thought, if this is how boys are, I don’t want any more boys! 🙂 Of course, his behavior really had nothing to do with his gender. When he was 3, I enrolled him in preschool, mainly because I needed a break. He was very smart so I expected him to do well in school. It’s amazing how your children’s issues are suddenly magnified 10 times as soon as you enroll them in school. He was just as wild at school as he was at home. After school, he would run as fast as he could straight to the car. One time the teacher asked to talk to me after school, but I didn’t stay long enough to hear her because Cody had run out the door. She made sure to call me with her concerns about Cody. She explained that he had dumped sand on a little girl’s head at recess, would not listen to the teachers when they asked him to put down a stick, refused to go to time out, had a hard time sitting in circle time (would always be touching the kids next to him and not paying attention), etc. She said I should give him consequences for his actions. Ha – as if he never had consequences. My parents also told me that I needed to spank him and discipline him. They gave me the book by Dr. James Dobson “Dare to Discipline.” I read it and was even more depressed than I was before. I tried everything it said in the book and nothing worked. I read other books, and nothing worked. I figured there wasn’t a book out there that had my kid figured out. I would spank him, and he’d laugh, and turn around and say “Spank me again!” or “That felt good!” So I figured that wasn’t going to work. It only made me feel worse. Time outs, when I could get him to stay in one spot, didn’t work to change any of his behaviors. Every day on the way to school, I would say, “You’re going to listen to your teachers today, right?” “You’re going to be nice to the other kids, right?” I thought if I reminded him, he might actually do it. He always answered, “I’ll try.” I had butterflies in my stomach every day when I went to pick him up, wondering what he might have done that day. I was afraid they were going to ask him to leave and I couldn’t handle the stress, so I pulled him out after the first semester, and we were moving anyway. I didn’t put him in school the first semester of 4-year old preschool because I was afraid of what would happen. But, by second semester, I figured I needed to get him in to prepare for Kindergarten. So, he started in January. He was put in a class with all boys – seven of them. He had the same difficulties, and a couple months earlier, in November, we had some missionary friends stay with us. It was quite embarassing for them to see how out of control he was, and how little I could do to control him. I knew after they left that they must be praying for him. Who wouldn’t? After another crazy Christmas (with lots of Christmas candy), and the doom of school overhead, I decided it was time to do something. I could tolerate his behavior at home because I was use to it, but I didn’t want him to get into trouble at school. A few months earlier, I had run across a post on Babycenter.com from a woman from Africa. She said she had moved to America and noticed a change in her boys when they started eating the typical American foods. They previously had no behavioural issues, and then all of sudden they were very hyper, off the wall, etc. She said she linked it to red dyes. I didn’t even know what red dyes were but I looked on some of our foods and drinks, and there it was. Cody had been drinking Ruby Red pink grapefruit juice every day (because he was allergic to milk), which had red dye in it. I removed that and did notice he was a little calmer and I tried to “limit” his consumption of red dyes. I had already noticed that every time he had candy or ice cream, he was terrible. So I had cut down on candy and ice cream, and when he did have candy, I tried to give him chocolate instead, thinking that would be better. But, he was still having problems. I asked my midwife what would cause him to be so hyper and she said, “Sugar.” I took him to a wholistic doctor and she told me yeast (she was absolutely right on this but more on that later), and that he had a hypersensitivity to light and a zinc deficiency. She shined a light in his eyes, and she said he almost passed out. Her husband who was there told me the same thing. He said he saw him get out of the car and run as fast as he could until he got to the shaded area, and then he stopped running and waited for me. I think that’s why he always ran to the car as soon as he would get out of the school. He never ran wildly through the parking lot. He just ran straight to the van. She also said to feed him less processed food. So thinking back to that post from the woman from Africa and seeing the changes I noticed when I did remove the red dye juice, I decided to look up red dyes and hyperactivity on the Internet. That’s when I came across the Feingold Diet. I remember vaguely reading about it before when I had read this woman’s post, but I remember thinking I would just do it on my own. (In other words, I was too cheap to pay the $75 or so for the membership and too prideful thinking I could do it myself). At this point, I needed help and was willing to do whatever it took to help my son. So, I immediately signed up and ordered my membership materials which included a detailed food shopping guide, a fast food restaurant guide, and a ton of reading materials and other helpful info. I was very impatient, as you have to wait about 2 weeks to get your shopping guide. By now, from reading the Feingold web site, I knew that what I was feeding my child was causing him to be hyper and have difficulties in school, and I didn’t want to continue to feed him this stuff one more day. They do give you a log in and password so you can go on the online forum and read and ask questions, so that was helpful as I was waiting. I got some ideas on getting started, and then emptied my shelves. We had bags full of Kraft macaroni and cheese (yellow dye), spaghettios (artificial flavor), Campbell’s soup, Pop Tarts, etc. Everything a typical American kid eats, or basically, everything on the commercials on Nickelodeon (which is one of the reasons my kids don’t watch Nickelodeon). Oh, and the fruit snacks of course- I thought these were good for him because the packaging said it contained lots of Vitamin C and it had fruit. I thought he was getting food from all the food groups from the food pyramid so we were doing good. I gave all the artificial food to an extended family member who was in diar need and she greatly appreciated it so I didn’t feel as bad wasting all that money and I figured her kids were eating this stuff anyway. Sometimes people feel bad giving away food they know is junk, but I figure everyone needs to come to that place for themselves. You not giving them the food isn’t going to change how they eat so I wouldn’t worry about it. I immediately noticed a change in Cody, like within 2-3 days. It often takes 2-3 days for artificials to work their way out of the body. He was a completely different child. In terms of hyperactivity, it was like night and day. He was calm and suddenly I could see his big brown eyes. Before that, I had never noticed that he never made eye contact. He was always in constant motion and fidgeting. He couldn’t hold a gaze or look you in the eye when he talked to you. Suddenly, he was making eye contact, stopped fidgeting, and stopped running everywhere! Hallelujah! I would say his hyperactivity went down 75% as soon as we pulled the artificials and preservatives. He was more focused and attentive and pleasant to be around. It seemed like everything I had been feeding into him from the discipline books I had read, he suddenly could implement. He had heard me (and he heard it often). He could obey. He knew what was expected of him, and when he would get silly, he could quickly regain composure if I asked him to – something he could never do before. I always felt like he had wanted to obey me, but he couldn’t. I could see the remorse in him when he got in trouble. Now it made sense. I really think when he was eating these foods every day, he lost a lot of his self control. Self control is one of the fruits of the spirits so if it is in your power to help your child regain self control, I think it’s a very good thing. I remember shortly after starting the diet feeling extremely guilty and sad. I grieved the loss of the first four and a half years of his life that could have been so much better. Instead I spent it spanking and scolding him, trying to get him to behave, and beating myself up thinking I was a terrible parent. The change in diet made it apparent that he couldn’t help it. As soon as we removed the foods, he was very eager to please us. I found myself no longer yelling all the time at him to behave. Our house was a much more peaceful place. When I found myself having to raise my voice again, it was almost always when he had had an infraction (eaten something he shouldn’t have). He was happy to do the diet because he wasn’t getting into trouble any more and now he could have ice cream and candy again – just without the dyes. He no longer became hyper from candy like before. It wasn’t all about the sugar after all as so many people were telling me. Yes, sugar is bad for you and can cause yeast overgrowth and short term hyperactivity. The difference is, with dyes, the hyperactivity/”sugar high” doesn’t only last a couple of hours. It can last a couple days and if they are eating it every day, then it becomes a constant state of hyperactivity. Another odd thing that happened when we had been on the diet for a couple months was that his hypersensitivity to light suddenly went away. This was a child who would not go outside without a hat on – ever. He hated the sun in his eyes. He always cried as a baby in the car, especially if we went out when the sun was going down. In the car, we had a hat, sunglasses, and an umbrella for him to hold to block the sun! He would scream and cry about the sun being in his eyes, so it was strange that the wholistic doctor had said he was hypersensitive to light. I didn’t know there was such a thing. When he was 2, I had to get a van so that we could get tinted windows. He did cry a lot less often in the car so I figured that helped him. One day on the way home from preschool before the diet, he started screaming and crying frantically, like he was in great pain. He said the sun was in his eyes. I had to pull the car over to get him to calm down. So, when after the diet, he suddenly stopped needing to wear a hat outside all the time, and stopped complaining about the sun being in his eyes, I was amazed. Apparently, this is not uncommon. Many kids have hyper sensitivities of the senses – meaning sight, sound, smell, noise, etc. Cody also used to have a lot of noise sensitivity issues. He hated when I ran the vacuum cleaner (luckily, it wasn’t that often :)) When you remove things that are offending the body, like the artificials, suddenly they improve. Their bodies know that there is something in them that is offensive, and their immune system is misreading it, and causing them to be sensitive in other areas. A week or so after starting the diet, Cody was coloring with markers and scratched his neck, and got marker on his neck. He broke out in hives, starting on his neck which quickly spread to his face, stomach, and legs. It was bizarre. They went away in a couple hours but I guess he was reacting to the dyes in the marker. That was the only time this happened. He colors with markers at school and gets them on his hands all the time and is fine, but I think because he had just removed all the dyes from his diet and his body was detoxing and cleansing itself, he had a strong reaction to it. One thing I noticed when we removed the artificials, was that he was definitely calmer, but all of sudden, he became very emotional and sometimes angry, and was crying a lot more. It took a few months to figure out that he could not tolerate corn syrup and chocolate. Once we removed those, he was much better, and to this day, if he has corn syrup, he will almost always cry the next day over something minor, or be very emotional/angered easily. Corn syrup has many names on labels so I usually rely on the Feingold shopping guide to find out what has corn syrup or not. Some common ones are maltodextrin, fructose, crystalline fructose, glucose, dextrin, dextrose, a lot of things ending in -ose. By first grade, he was receiving rewards – Excellence in Social Habits and Excellence in Work Habits. To receive these awards, they had to show consistent good habits in areas like relating well to peers, using time wisely, etc. He also was chosen to recieve the Diligence Award for working with all his heart. He won the first grade spelling bee and always gets comments like “A pleasure to have in the classroom” now on his report cards. We would have never seen comments like that in preschool before Feingold. In first and second grade, the kids would have to flip a card if they were misbehaving – talking, goofing off, etc. Cody only got flipped a handful of times the entire year. Many kids got flipped nearly every day. He would come home and beg me to let him talk to the moms of the kids in his class. He said he would stand at the door during dismissal and tell them about Feingold or hand them out little business cards. 🙂 He likes to tell the teachers that kids are misbehaving because of the dyes they are eating in their food. I think sometimes people can get offended by that, but they’d have to know Cody to understand that he’s really not trying to judge them. He wants to help them. He would also love for everyone to be eating the same foods that he is, but that’s not why he is telling them that. I’ve educated him on what dyes and artificials are made from and how God never intended for us to eat them and how it can cause many health problems. As to why we will always continue to follow Feingold – after reading a lot about dyes and where they come from, it is not something I wish to feed to my kids or myself. Artificial flavors and colors are just that – artificial. They’re fake additives made in a laboratory from chemicals derived from petroleum oil tar – stuff you put in your car. Studies have been done showing that these dyes cause cancer in rats – so what is it doing to our children? Whenever you hear of someone that has died, a common response is often to ask if they had cancer. Not often do you hear of someone dying from old age. Everyone is pretty much dying from heart disease or cancer. I believe most of that is caused by what we are putting into our bodies. Our food supply has veered off so dramatically from where it originally started. God provided all the food that we needed to eat – fruits, vegetables, grains, meats, herbs, etc. In search for a cheaper and quicker way to mass produce foods, man went and created something in a laboratory. When we try to play God, bad things happen. I don’t feel that I’m depriving my children by not letting them eat what everyone else is eating. I feel I’m protecting them from dangerous foods that God never intended for them to eat. We are being brainwashed by TV commercials and ads that tell us what is good for our kids instead of researching it ourselves. Nothing with dyes or artificial flavors or preservatives can be good for our kids, no matter what other healthy ingredients are thrown in there with it. Some kids will not react to these chemicals with ADHD like symptoms. About 50% of kids have a chemical in their brains that will react negatively to the chemicals in these artificials, causing hyperactivity and other ADHD characteristics. I’m glad my kid was one of them or I would have continued to feed my kids these foods, not knowing any better. That particular chemical in the brain is hereditary, but if you pull the artificials, you’ll see that ADHD doesn’t have to be. Another percentage of kids can have ADHD symptoms caused by eating gluten and dairy. However, I’ve found that doing Feingold has been enough for our kids. If you have been following Feingold and it isn’t helping, gluten and dairy free might be another option that can be helpful, although GFCF is known more for helping kids with autistic characteristics. Not everyone has the same conviction and I don’t judge anyone for feeding their kids artificials, but for me, it’s not something that I wish to do. I also believe that SO many parents, (I was one of them) do not understand what they are feeding their kids, what is in these artificial ingredients, and what it can do to them – both the immediate effects, and the long term effects. Oprah always says, “When you know better, you do better.” Before I didn’t know this stuff was bad, but now I do. I believe it’s only a matter of time before they start removing these artificials from our foods anyway. Artificials are already banned from foods in other countries like Europe. The U.S. food supply is probably the worst in the world healthwise. America is all about money and profits. If it’s cheaper to use artficial colors than real colors from fruits and vegetables, than that is what they are going to use. They are not concerned with our health, until we are. It will only change when parents stop buying foods with dyes and place a higher demand on foods with all natural ingredients. We’re already seeing that in the demand for organic foods, which almost never contain artificial ingredients – though some contain corn syrup. Since Cody is almost 9 now and doing well in school, I have not been as strict on the stage 2 foods on Feingold. Feingold also eliminates certain fruits and vegetables for the first 6 weeks, and then you add them back in to test if they can tolerate them. Stage 2 are foods like oranges, grapes, apples, tomatoes, berries, cinnamon, etc. These contain naturally occuring chemicals called salycilates which the fruit produce to ward off bugs. I believe that it is somehow linked to the use of pesticides, that the fruits today are producing more salycilates, causing problems for our kids. The salycilates can cause some of the same ADHD characteristics and other behaviors like Tourette’s Syndrome in our kids. 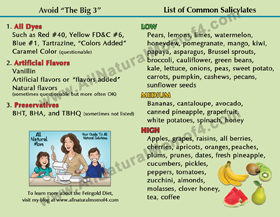 My kids do react to salycilates, but I figure at least they are not eating food that is bad for them healthwise. So, we restrict stage 2, but not completely. My kids do get Tourette symptoms from salycilates – chewing on shirt collars, blinking hard, repeated coughing, sniffing, etc. Some of that can also be caused by yeast overgrowth from yeast feeding fruits and sugar. Cody eats an apple almost every day. If we pull the stage 2 fruits, he stops “ticcing” immediately. If it’s not disrupting his life, or annoying us too much, I just let him have the fruits. 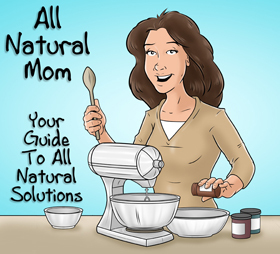 One reason why I wanted to write this blog and provide lists, recipes, and information on foods that are free from these chemicals is because I want parents who want to avoid these things, be able to do it, and the more the merrier. I think God must be saddened to see his children feasting on terrible chemicals when he has provided every good thing for us to eat. You don’t have to buy all organic foods to avoid artificials, but you do need to know which foods and brands don’t add these to their products, which is why we are members of Feingold. You could read labels, but sometimes they add preservatives to the packaging or the ingredient is hidden in another ingredient listed, and you wouldn’t know that unless you call each manufacturer, which is what Feingold does. If more parents choose to feed their kids better foods, it will create more of a demand and eventually maybe even the government will finally listen and ban these ingredients from our foods. There’s power in numbers. I LOVE that our school district (Kane County) just passed a new regulation this year which bans treats at school for birthdays, holiday parties, no reason whatsoever, etc. It really gets ridiculous when our kids are eating donuts, cookies, cup cakes, etc. almost weekly from birthdays or parties. I’m not saying we shouldn’t celebrate, but we are feeding our kids so much garbage and then we wonder why they are so overweight and sick all the time. Why aren’t we teaching our kids healthy eating habits? Why do so many of our kids have ADHD and learning difficulties? When we bombard our bodies with so much sugar (dyes aside here), their bodies’ immune systems immediately are weakened and they are less able to fight off viruses and bacteria. Why not give them the best chance possible to stay healthy and focus at school by not allowing them to eat so many sweets? We as parents need to vocalize our concerns to our schools and take a stand for our kids’ health. This diet has been a God send. I don’t know how we could have been able to handle years and years of the old behavior, and we definitely would have never had any more children, let alone another boy! 🙂 Now, we have three beautiful children, two boys and a girl, and I can honestly say, I actually enjoy them. I’ve learned to view children as God intended – a blessing, not a burden. Thanks for writing such an in depth story. I am at my wits end with my 7 yr old. I feel how you felt, like a terrible mom. I don't want to put him on medication so we thought we would research this first. Thanks. I just want to let you know that as I was reading your story I started to cry (here in my office). You have described my 4 year old son's behavior better than I can. I'm just so glad that I have found your website and I will start looking into the diet right away. Thank you for having this website to help other desperate parents. May God bless you and your family. As a teacher, I wish every parent in America could read this post. I see the effects of all of these chemicals on children every day. I have actually had parents get MAD at me when I tell them no processed foods of any kind are allowed in my classroom. The first thing I ask parents when they come to me for behavior conferences is "what does your child eat? ".